Style, sophistication, and soul. That’s what Alfa Anderson, Luci Martin, and Norma Jean Wright brought to CHIC as the group’s original lead vocalists. Alongside producers Nile Rodgers and Bernard Edwards, and drummer Tony Thompson, these legendary ladies made CHIC synonymous with infectious hooks and timeless grooves. They collected a wall of gold and platinum albums, fueling the charts with hits that dominated clubs and airwaves across the globe. To the delight of their dedicated fans, Alfa, Luci, and Norma Jean have reunited as Anderson, Martin & Wright to celebrate a legacy that encompasses some of the most groundbreaking music ever recorded. 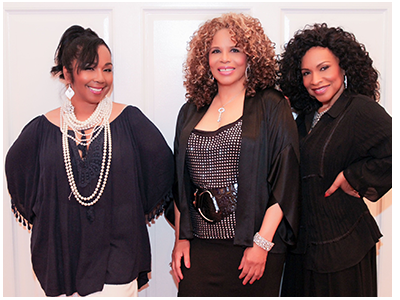 Throughout the '70s and '80s, Alfa, Luci, and Norma Jean also lent background vocals to the CHIC Organization’s high profile productions for artists. Alfa and Norma sang on the Grammy-nominated title track to We Are Family (1979) by Sister Sledge, which instantly became a worldwide anthem. Before singing on I Love My Lady (1981) by Johnny Mathis, Alfa and Luci contributed vocals to Diana Ross' number one R&B album diana (1980). Miss Ross received a Grammy nomination for "Upside Down," which topped the pop, R&B, and dance charts and subsequently became part of CHIC's stage show along with "I'm Coming Out." Following their tenure in CHIC, Alfa, Luci, and Norma Jean each worked with an array of music icons including Aretha Franklin, Mick Jagger, Madonna, Bryan Adams, Melba Moore, and Bryan Ferry. Alfa toured with Luther Vandross for many years and founded Voices of Shalom while Luci and Norma formed a duo and brought disco hits to new generations of listeners. Parallel to each vocalist’s many creative pursuits, CHIC’s seminal contributions to popular music were recognized by some of the music industry’s most prestigious organizations, including a nomination for the Rock & Roll Hall of Fame. No less an authority than Rolling Stone even placed “Good Times” on the magazine’s “500 Greatest Songs of All Time” list. In recent years, Alfa, Luci, and Norma Jean explored possible vehicles to relaunch the classic vocal sound they introduced in CHIC. The first step towards their current collaboration arrived in 2010 when the three reunited on Tinkr B. and Lu-Fuki’s “My Lover’s Arms.” With new music in the works, Alfa, Luci, and Norma Jean are ready to deliver their classy, high-energy, roof-raising show to audiences all around the world. Indeed, the good times are just beginning.